Due to scheduled maintenance, some areas and features of the RTD website may be intermittently unavailable from 8:00 p.m. - 9:00 p.m. This includes schedules, rider alerts, and RTD news items, system maps, and customer comment form. We apologize for any inconvenience. 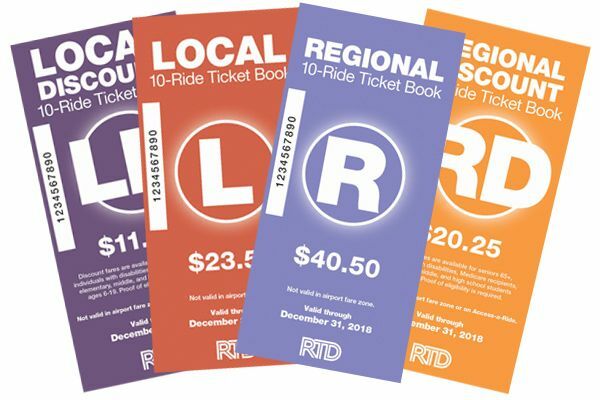 Due to the new 2019 RTD fare policy, expired 2018 10-Ride tickets, day passes or Access-a-Ride tickets will only be accepted as valid fare payment until January 31, 2019. No exchanges of 2018 tickets allowed after this date. Before you toss out your expired 2018 10-Ride tickets, day passes or Access-A-Ride tickets, take a look at our exchange policy. Unused tickets or passes expired as of December 31, 2018 will be accepted as valid fare payment until January 31st, 2019. You can also exchange the unused 10-Ride tickets, day passes, or Access-A-Ride tickets up to January 31st, 2019 and receive credit toward the purchase of stored value on a MyRide smart card (when exchange is done in person) or 2019 ticket books, or monthly passes. Exchanges can be made in person at RTD-operated sales outlets or by mail. Credit will be given toward the purchase of full ticket books only. Ticket-for-ticket exchange is not available. To exchange paper fare products by mail, use the Exchange Rate Chart below for the amount of credit and to calculate the remaining amount due. Include the expired paper fare products along with a check or money order made payable to RTD for the 2019 product you wish to purchase and mail to RTD Accounting Office, P.O. Box 9769, Denver, CO 80209-0769. Please include your name, address and phone number. Allow up to 30 days to receive your 2019 ticket book(s). You can receive credit for up to 10 ticket books or pass books in person at RTD-operated sales outlets at Civic Center Station, Union Station, Downtown Boulder Station, Boulder Junction at Depot Square Station, and the RTD Sales Counter at Denver Airport Station. Exchanges cannot be made at third-party sales outlets such as King Soopers and Safeway. For exchanges of more than 10 ticket books or pass books, please mail them to RTD's Accounting Office, P.O. Box 9769, Denver, CO 80209-0769. As of February 1, 2019 Access-a-Ride customers will no longer be able to use 10-Ride Tickets for an Access-a-Ride trip. 2019 Access-a-Ride tickets will be sold in books of 6, and will be the only tickets allowed for trips on Access-a-Ride. RTD provides bus and rail service to the Denver metro area.